Processing crude oil results in wastewater containing oil. In order for this wastewater to be processed, it must be separated into its main constituents of oil, water and solid. In doing so, it is important to recover as much oil as possible, and dispose of the other components inexpensively. 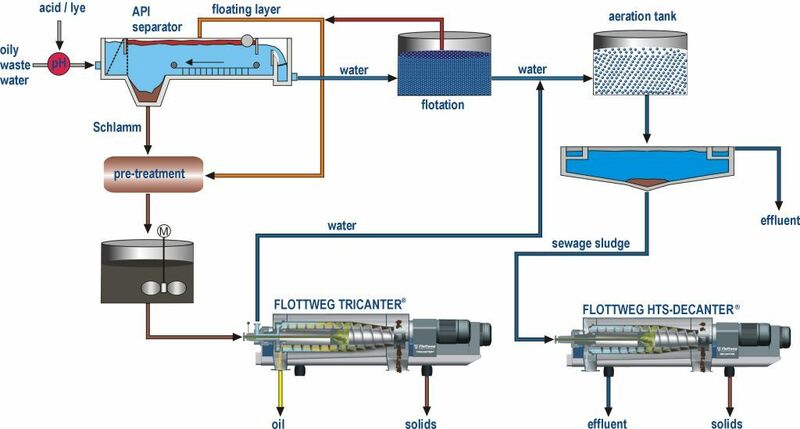 The Flottweg Tricanter® is specifically configured for this continuous separation of the 3 phases, and separates the components in one procedure. The actual wastewater treatment is performed in a mechanical/biological sewage treatment plant. This gives rise to sewage slurry which has to be dewatered as far as possible so it generates minimum costs during further processing. 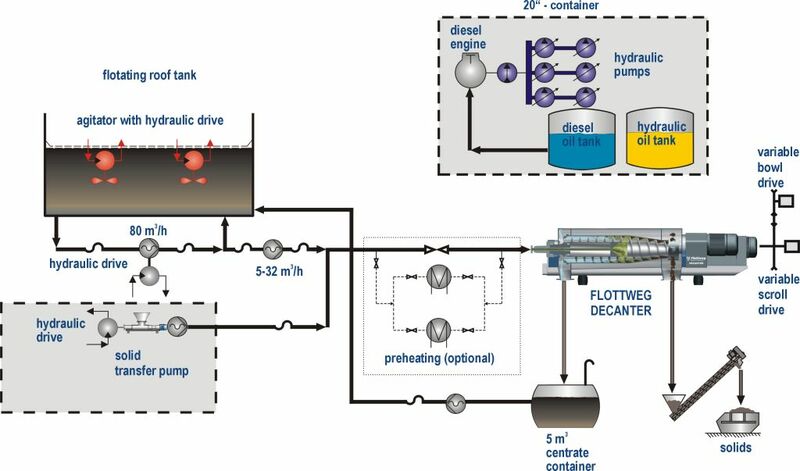 Flottweg developed the decanter specifically for dewatering sewage slurry, and uses it in industrial sewage treatment plants. Often, wastewater containing oil and residues are disposed of in large ponds – referred to as ditch tanks. Even today, there are enormous lagoons and ponds in which these oil sludges have been stored over decades. Flottweg offers you the optimum solution for processing oil sludges from ponds and lagoons. We supply complete systems for processing oil sludges from ponds and lagoons. They include an oil extraction station which pumps the oil sludge out of the ponds. The suction pump is mounted on a pontoon that floats on the pond. If required, steam heaters are used in the intake area of the pump in order to liquefy the oil. 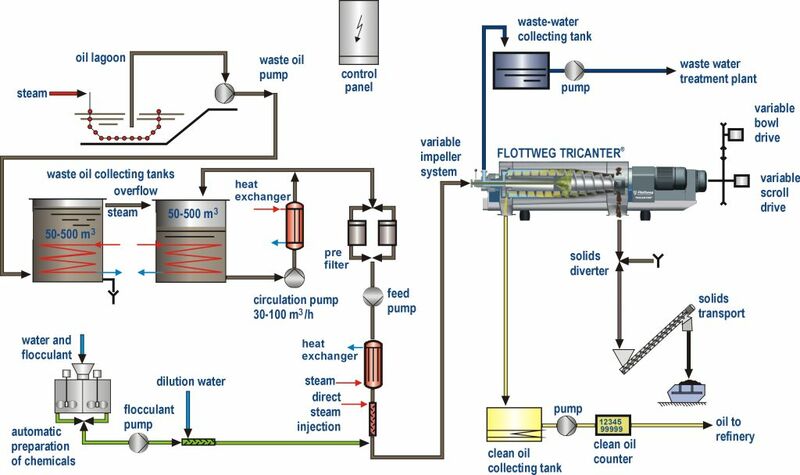 The extracted oil sludge is processed, and separated into oil, water and solid by Tricanter®. The separated solid is only approx. 10 – 20% of the original quantity of sludge. This reduces transport, landfill and incineration costs significantly. When crude oil is stored in tanks, a layer of heavy hydrocarbons (paraffins) and impurities such as sand, rust and heavy metals builds up at the bottom. This significantly reduces the useful volume of the tank. As a result, processing residues containing oil from the cleaning of crude oil tanks plays an important role in terms of efficiency. The tank must be completely emptied and cleaned before inspections, maintenance or repair work. Depending on the size of the tank, there can be a residue of up to 1000 t that has to be disposed of – such as by incineration. Alternatively, the residues containing oil from cleaning crude oil tanks can be processed using the Flottweg Tricanter®. This involves recovering a large part of the oil, the water can be sent to the sewage treatment plant and only about 10% of the original quantity remains to be incinerated. 90-95% of the oil contained in the residue is recovered as crude oil. This makes it possible to recover a large part of the tank cleaning costs. The solid can be sent to landfill, as well as being transported and incinerated without posing any significant environmental hazard. This reduces transport and landfill costs enormously.